This makeup line is amazing! I bout the un-coverup and this brush is THE COOLEST! Would love to hear your opinion – are you going all Insta Stories or staying all Snapchat or a mix? If it’s a mix, how are you choosing when to use each one? Bachelor In Paradise. I admit it, I could not stop watching! (#goawaychad) I even got so engrossed that I forgot about and missed The Hills, ughhhh! Definitely a temp housing negative is no DVR. Blonde Dry Shampoo. Listen up blonde friends, you NEED this try shampoo. You know how our roots get a little dark and dingy between washes but the rest of our color is hanging in tight? Well, this dry shampoo puffs in a little color for you, lightening up your roots while adding volume. Buy it here. 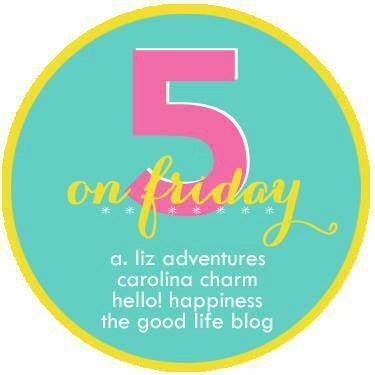 Here’s who I’m teaming up with today on this Five on Friday: A. Liz Adventures, Carolina Charm, Hello! Happiness and The Good Life.